Use dog tubs to clean and bathe your dog with ease. Browse our dog tubs and choose from different dog tub shapes and sizes perfect for your dirty dog. 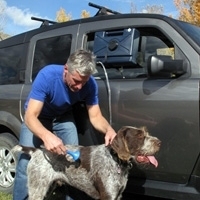 A clean dog on the go or at home! The K9 Shower is perfect for cooling off agility or flyball dogs! Great for beach dogs or use after a long hike. *When you click on the "More Info" button you can read about the latest Dog Grooming Tubs.